The base is made from short pieces of "2x4" stock. Special ledges inside let you raise and lower the plant platform in 1-1/2" increments. Roof allows some sun and rain to reach plants. Measures 63"H x 30" diameter. 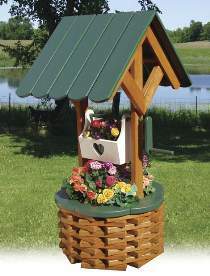 Holds two plastic planter box liners inside the well and one inside the basket.